So far, Motorola’s Moto Maker service has allowed you to order a very personalized Moto X from the company. 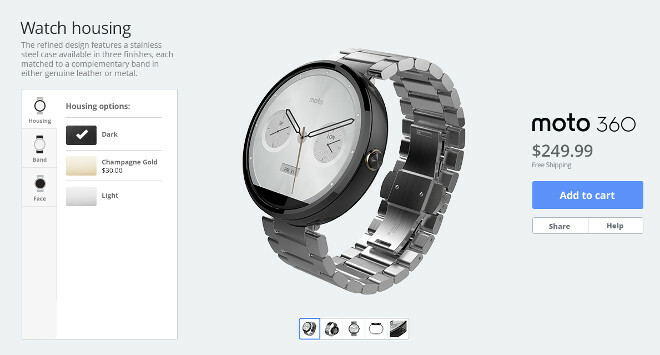 But next month it will become available for the Moto 360 smartwatch too. You’ll get to choose a casing – either silver, black, or champagne gold. Then you pick a band size, from the two available. The band itself can be either metal or leather. And finally, you select one of 11 watch faces, and the one you like will show up when you first turn the wearable on. This extension of the Moto Maker program to the Moto 360 has been planned ever since the company was working on its first smartwatch, but only now have all the pieces fallen into place. It looks like Motorola had to postpone this launch in order to get the Moto 360 out soon enough as to not miss the first wave of Android Wear devices. The customization options aren’t as plentiful as in the case of the Moto X, but this is still a big step for smartwatches. After you’ve designed your very own Moto 360, the factory in Shenzhen, China will build it and ship it to you. Interestingly, it’s alleged that if you don’t like the design once it reaches your doorstep, you can simply send it back and try again.